Usually the National Day of Prayer is held on the first Thursday of May each year. On this day people of all faiths join to unified public prayer for the nation. This day is devoted for interceding for America’s leaders and families. The National Day of Prayer first time was organized in 1952 when United States Congress issued the joint resolution, which was signed into law by President Harry S. Truman. On this day all the nation is invited to mobilize in prayer to intercede for countries leaders and families. As Christians, we know that it’s very important that we pray for one another. 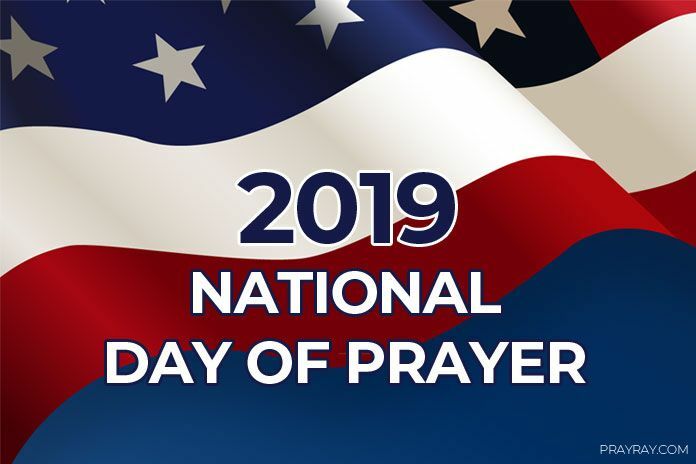 This year National Day of Prayer 2019 will take place on Thursday, May 2. So this will be the 67th Annual National Observance. Public prayer and national days of prayer have a long history in American society. Since the first call to prayer in 1775, when colonies were asked by the Continental Congress to pray for wisdom in forming a nation, the call to prayer has continued through America’s history. In 1863 President Lincoln’s announced Humiliation, fasting, and prayer” day, but only in the 1952 year, an annual National day of prayer declared. Finally, in 1988 President Reagan signed the law which set this day on the first Thursday of May every year. So each year, the President of United States signs a proclamation, encouraging all Americans to join in prayer. As a result, already have been 143 national calls to prayer, fasting, humiliation, and thanksgiving by the President of the United States in the 1789-2014 period. National Day of Prayer is significant and important for the nation. This day enables to remember how the founding fathers of the nation based their decisions in faith to God. Prayer brings different people together and prayer unites all people and different political parties. Also, prayer reminds us that we all are created in God’s image and likeness. God desires for us to represent Him everywhere we go and in everything we do. We know that without God we are nothing! Let God be the leader of all our nation life each day. So on this day, all the nation comes with the humbled hearts before God. All the nation asks for His guidance and support for the leaders and His Grace to all the people. This day is especially important in these difficult times when the political situation is unstable. Our national leaders face difficult decisions, sometimes they lack love for one another. This day unites all Americans from different political, ethnic, and socio-economic backgrounds in prayer for all the nation and its leaders. Only unconditional love for one another on different levels can change the nation and all the world. We should remember the words of Jesus and implement them in our daily lives. Let’s pray together God to teach us to love one another as Jesus loved us. That is difficult but not impossible, let’s make a try. America to love one another. As is stated in John 13:34 “Love one another. Just as I have loved you”. By these words Jesus tells us to love one another and this includes every person in all the world. We should love one another unconditionally because Jesus showed us an example of such a love. He has sent the Holy Spirit to empower us. In our prayers let’s ask God to replace hate with love and criticism of one another with love for one another. For the Church in America to love one another. John 13:35 says, “By this everyone will know that you are my disciples, if you love one another.” Jesus explains to his disciples that only love to each other distinct us from others. Let’s ask God to make our church loving one. Ask that all churches in America to love one another and to cooperate together for the greater purpose. For families, communities and cities in Amerika to love one another. Bible states in 1 John 4:7, “Dear friends, let us love one another, because love is from God, and everyone who loves has been born of God and knows God.” By belonging to Jesus, we belong to love. Let all people know that love is always God’s way. Ask God to maket all families, workplaces, communities, and cities can experience the transforming power of love. Let everybody choose unconditional love. For all ethnicities and people in America to love one another. “Love finds no joy in unrighteousness but rejoices in the truth. It bears all things, believes all things, hopes all things, endures all things. Love never ends.” (1 Corinthians 13:6-8). We all are made in the image of God and we all are of one race. Love never ends. By the death on the cross Jesus has torn down all the walls that divide us and opened a new pathway for us to love one another. Let’s ask God to give us power to choose a new future together where everybody lives in unconditional love. For we will love God and each other so much that we will pray for the next great spiritual awakening in America. “Besides this, since you know the time, it is already the hour for you to wake up from sleep, because now our salvation is nearer than when we first believed.” (Romans 13:11). We live in a significant moment and difficult times for America. We need the next Great Spiritual Awakening of our nation. Let’s ask God that such awakening occur in our generation. Let’s unite in National Day of Prayer 2019 asking God to teach us love one another. Only unconditional love can save the world and our nation. Let’s unite in our prayer with love for one another and let everybody experience how powerful and transforming is real love.